5 Digital Satellite Receiver & Exchanges act to statistically analyze and receive /exchange the 90 ports digital satellite TS signal, then multiplex as 15 ports ASI outputs to core server. The Network Media Server function as a professional 8 ports mpeg2/4, Full D1 real-time hardware encoders/decoders for 8 local TV program with AV/DV inputs, it’s SDH (Synchronous Digital Hierarchy) fiber port (STM-1) is as for input of the province programs stream. The Gigabit Ethernet port of net media server is used to output the compressed programs streaming with MPEG-2/4 format to core server through LAN/WAN. It support TCP/IP and RTP/RTCP protocol, accord with SNMP V3 and realize long-distance network administration. 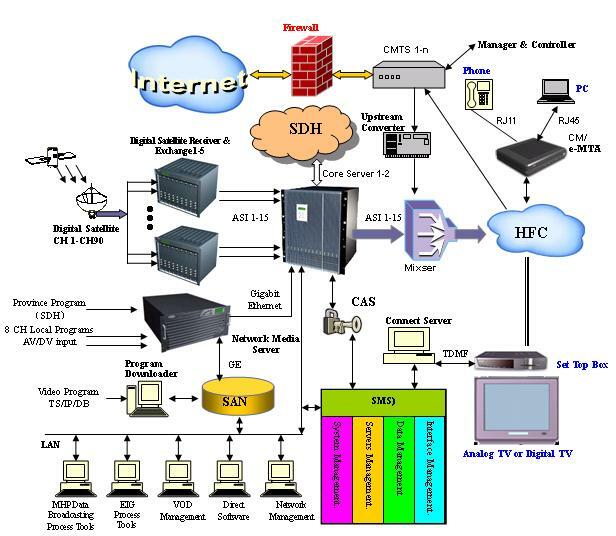 2 Core Servers act as main equipments of the DVB (Digital Video Broadcasting ) Head-End System, input 15 ASI CHs from 5 Digital Satellite Receiver & Exchanges, 2 Gigabit Ethernets with ICP/IP, RTP/RTCP protocol from Network Media Server and the SAN witch acts as huge programs storage in MPEG-2/4 and data broadcasting format. The Core Server real-time multiplex all inputs and broadcast 96 Digital TV CHs to HFC (hybrid Fiber Coax-cable) network through mixers, and can transport the programs to backbone SDH network. The operator can manage and control Core Server through internet. In this DVB architecture, the Core Servers act as core equipments, for collecting the satellite TV program, the DTV program transported from SDH, local TV program, and others from internet. According to operator management, all the information’s and programs in MPEG2/MPEG4 format can be stored in disk or broadcasted to HFC with MHP (Multimedia Home Platform) requirement. A QAM (Quadrature Amplitude Modulation) module is embedded in the core server, for multiplexing TS (Transport Stream), broadcasting to HFC through mixers, then transporting to every DTV user. The ASI (Asynchronous Serial Interface) stream can be transformed to DS3 format, transporting through SDH backbone. Subscriber Management System (SMS) is an indispensable and crucial system in digital TV business, which plays very important role for DTV service provider to manage DTV platform, and helps them developing the DTV market. Based on the long-term experience of offering solutions for service provider, our SMS not only provides the management of subscriber and charging, but also take the idea of management and the manner of service throughout the software. Besides fully considering of technical factors, SMS involves many factors such as management, service, market promotion, consumer service etc. It is in possession of advancement, flexibility, openness, credibility and efficiency platform, and can support digital TV service provider increasing the profit through digital TV service. The system supports local TV operators to supplying MHP data broadcasting service with HTML4.0 format. With the platform of MHP, data broadcasting streaming and the web page can be packaged in TS format and broadcasted by the Core Server.